So, even though my building skills have improved a bit, I'm still not able to get elevons dead even on elevator function even with trim, one is always moving at a slightly different rate. I just don't think I can build at that level of precision. What techniques does everyone use to get this right? Would a v bend in the rod help by physically adjusting trim? This killed my latest slender delta attempt. It flew and started climbing, but rolling a bit and being new to the plane did not have the reaction time to make the corrections and rolled into the dirt, completely busted. I need to be able to get some time on this plane to learn it before it's trashed. I use linkage stoppers to even out my ailerons, use the table edge to get them dead flat with the wing, then I usually end up trimming it all up nice and high off the ground as something else was bent! Trying to get high enough to trim something that’s very out of trim is hard, plus with high Alpha you can’t glide test. If possible launch with your elevon control hand on the stick so you can keep the roll axis a bit more neutral and try launching over the most forgiving surface available to minimise accident damage? In the mean time, while I get feedback and do research, I think I may take a different approach to my project. It may be easier for me to build a tailed slender delta AET, something like this. It would probably have a bit different cg. That way I have a single elevator for clean climbs on takeoff, and if ailerons are a hair imperfect, it should still fly fine with a slight bias towards one side on turns. Pictures and or video would help. But if they are moving at different rates I would look really close at the control horns to see if they are both centered and are the exact same distance from the hinge line and surface. 1mm out is all it takes and then you have two different mechanical throw rates. Also check that the control rods are mounted the same in the servo control arms and then check to see if they both move the excact same amount. I have had servos that didn't move the same. That makes sense. I know for sure they were not perfect down to the millimeter. Next time I try elevons I will try to get them dead on, but like I said. Not the best fine motor skills. From a building standpoint, RET and AET planes are much more forgiving because the surfaces don't need to be in perfect tandem-so I think I will take a crack at an AET version of my bird with tail feathers, and practice my precision on the ailerons. If I get them perfect, bonus, if not, it won't kill my plane. That first maiden flight is always fun. Honestly it is best to get someone with more skill to maiden and trim if you are not comfortable with it. Or at very least have a helper with you to click the trims for you. Sometimes I maiden something that is so far out of trim that it takes 2 hands and all my concentration to keep it flying, having someone to click the trims in these cases makes all the difference. I can only add that with any delta, and a slender one in particular, will be sensitive in roll although by comparison fairly gentle in pitch. Such characteristics would be considered "poor harmonisation" in a conventional plane but if using elevons on a delta you just have to get used to it. My very slim HP 115 delta does have a 'stabiliser' Rx which at least tames any turbulence upsets but it still has a stunning roll rate with full 'aileron' input. I am not sure what you are using to mix your elevons, but that is a big factor as well. If it was just a "turn on elevon" setting in the TX you should probably be ok, but if it is something you mixed manually you may have something out of sync. As quorneg said above, your elevon pitch vs roll axis bias is something I would look at as well. I have a "elevon" pre mix setting on my TX, but I found all of my elevon only airframes work much better with my own mix and bias. Good info. I have worked with(and failed) at several iterations. I know what I'm working with as far as natural flight characteristics, I had heavy expo on the roll axis because I know how touchy it is. The thing that got me is the plane began to roll in what was supposed to be a straight climb because of the disparity in the elevon function and I didn't have a feel for it or enough reaction time to correct. By the way...you have a functioning hp-115 model? If I had to pick a favorite historical plane, that would be the one. If there is video of it, chances are I have thoroughly studied it already because I've only seen one or two rc hp-115's. It's a simple pre-set elevon option and heavy expo on the roll to deal with the bias. It's looking like physical build slop is the culprit. I'll have to get the control horns perfect to the millimeter and double check my servos next time. Debating trying with elevons again or taking an AET approach. Only thing is, I'm not well versed in aerodynamics enough to know how the tail feathers will affect the plane's cg, high AOA performance, etc. 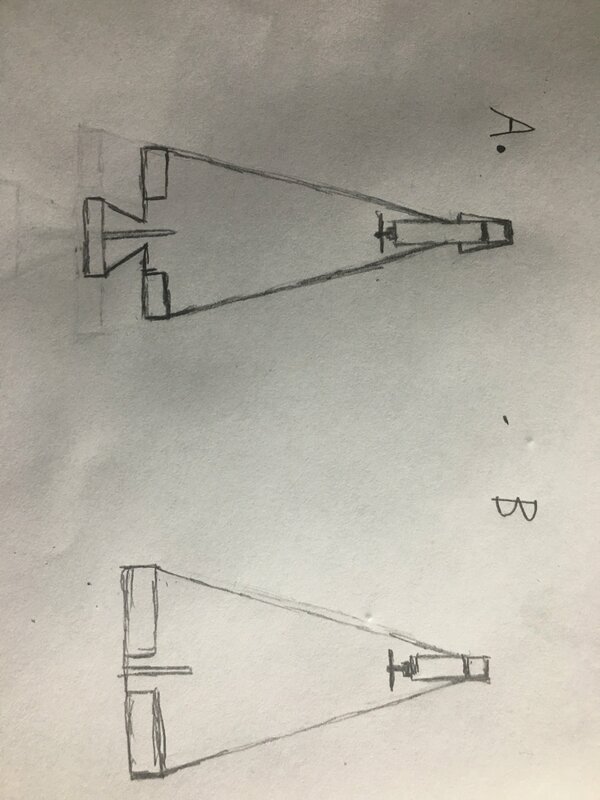 Quick rough top sketches of option A, tailed, option B, the current model. This plane uses a high mounted pusher. Depending on the airframe, the pre-set mix can be way off. Setting expo may or may not work depending on your control horn/rod placement. You will notice that you usually will only get 50% throws on one axis with the default mix and 100% only when in full bank and pitch. This becomes a problem when you do not have enough pitch authority on it's own. Putting a ton of expo on the roll axis will not help that issue. I would continue with your current elevon set up and just get it tuned. From your sketch I do not see any reason why elevons would not work. To get the best from my elevon setups I use servos of the same type and from the same manufacturer in each wing of the build I am setting up. After getting the servo arms as close as I can physically I some times end up with a small angular difference in the servo output arms at neutral position. To get the angle the same on both servos I go into the Tx and adjust the offset trim so that the servo output arms are equal in angle. With the balance done I then adjust the mechanical linkages to give the proper elevon angle for each wing. Now I set the expo and any other changes in the Tx but do not readjust the sub-trim/offset trim. It works for me on elevons and on ailerons including those setups with differential. Done carefully it can give a sweet handling bird indeed. I did much the same, balancing mine out with Sub Trim, which allowed me to zero it out. Made a HUGE difference with my Versa Wing. I may add v bends in my rods then for physical trim. I've used the subtrim to get them started level but not messed with offset trim. With mine it's not so much starting level but moving at a slightly different rate. I also always use the same type of servos. I'll see what I can do. Slightly different rate side to side should not cause a big deal as long as both are neutral, some models have to add differential to the ailerons, elevons to get good roll characteristic. Almost makes me wonder if something else is going on here as stated pictures are worth a thousand words. Not a different side to side rate, a different rate on elevator function, one moving up at a slightly faster rate even tough they begin level. My plane would therefore roll during climb using only elevator function and not intending to bank or roll. Did you center your servos and arms to be at 90 degrees to the servo before hooking up the linkage. I let the servos center themselves when I fired up the transmitter, before installing them and the linkages onto the airframe. looked to still be a slight imperfection. The plane is totalled and scrapped now, but I will have pics of the next build, especially if it has problems on function check. Is there a function on the transmitter settings that would let me center the servos even further? When starting a new build ensure that you reset all of the trims, (including sub-trims), to their default value before you proceed or you could find that nothing will align properly in the future! Good responses from everyone. I'll take all of this into consideration next time I rebuild. I am still considering trying the tailed AET version, out of curiosity's sake. The devil I know or the devil I don't. Should be interesting either way. As fun a diversion as pursuing the tailed option could be, as a builder I should know how to do elevons right sooner than later, especially as @CustomRCMods is releasing plans for his Concord in the next few days.